AppsFlyer provides tracking solutions for out-of-store Android apps, in addition to its tracking for Google Play apps. In both cases the developer has to prepare a separate APK for each out of store market which promotes the app. The difference between the methods is mainly reflected on AppsFlyer's dashboard and reports. See the combined results of your marketing efforts across different markets (Google Play store and out-of-store markets) under a single app's dashboard. The attribution raw data contains the Install App Store value. When not empty, this value is the name of the out-of-store market that brings the new install, as set by the developer. Otherwise, the install is attributed to Google Play store. Single App solution is best for advertisers that need to see all non-organic installs and in-app events from all markets under a single app's dashboard on AppsFlyer. Please note that with this solution the out-of-store market name is currently only in the non-organic and organic raw data reports. Make sure your account has access to raw data or upgrade it before implementing this method. See organic and non-organic installs and in-app events data per market on separate app dashboards on AppsFlyer. With this solution each market entails a different APK, as well as designated tracking links. The results are displayed per market and not under a single app's dashboard. 1. Multiple Apps solution is best for advertisers that prefer knowing the out-of-store markets where their organic users came from, to seeing the results under a single app. 2. There are vendors that own markets, Android devices or Android browsers. In some cases, this causes the download of APKs from the wrong stores, which may deeply affect the accuracy of the attribution when using the Multiple Apps solution. To setup tracking for out-of-store markets, with either method, follow the instructions below. The results are displayed under your existing app's dashboard. Insert your Android Package Name (eg. com.greatapp) and the Channel Name you are planning to promote your application on. Create a copy of your app's build. 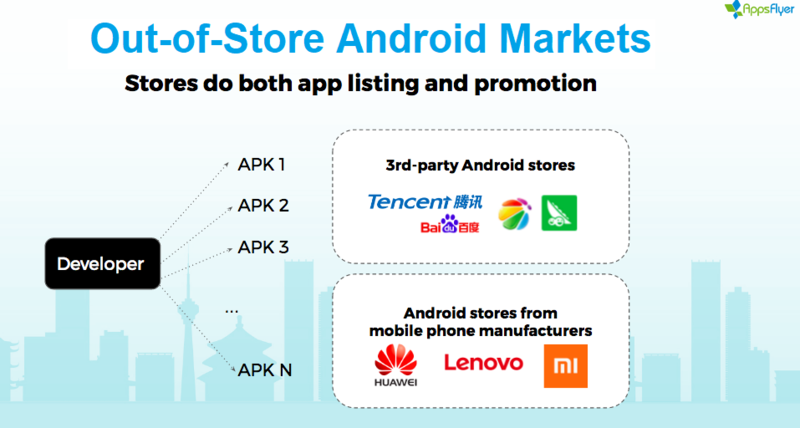 Where the value (in the above example "baidu") represents the store name for this specific APK. Migrating from multiple apps method to single app method? 2. Make sure the AF_STORE value is the same value you used for the Channel. Add to the Android manifest.XML the line below using the exact channel name you just used for adding the app to the AppsFlyer platform. The channel definition MUST take place within the <application>..</application> tags. The channel name is case sensitive. Make sure the value in the manifest and the value entered in the dashboard are identical. When creating tracking links for out-of-store markets it is essential to always include the af_r macro, which redirects users to the correct market based on its URL value. Go to Integrated Partners Configuration and choose the network you want to work with. Out of store media sources make use of ID matching for attribution, while AppsFlyer's Fingerprinting serves as a fallback method. 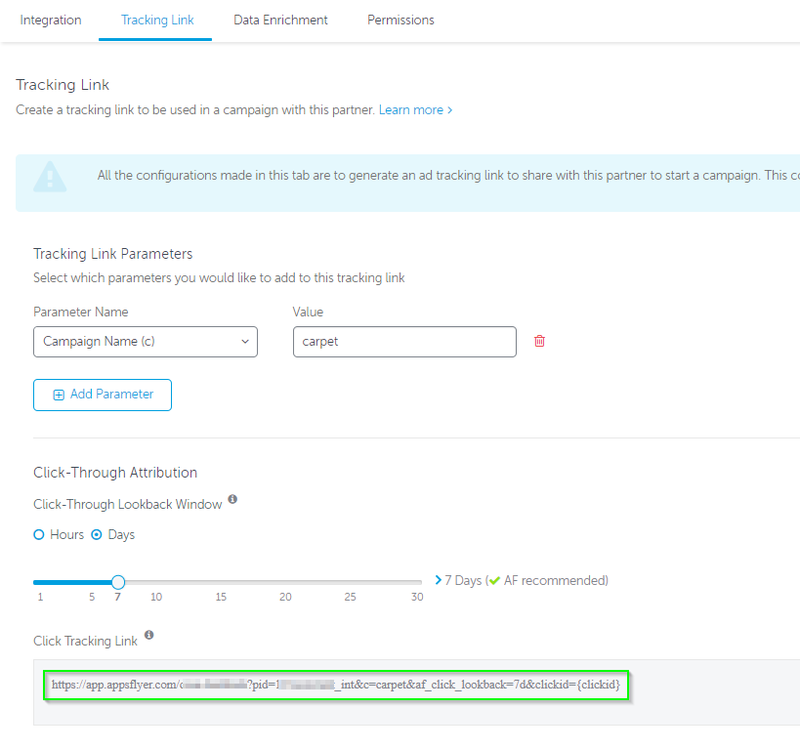 You can track out-of-store installs coming from your owned media, such as email or SMS campaigns, by creating custom tracking links. Since it's not possible to extract device IDs from owned media, the android_id and advertising_id parameters should not be used with these links. 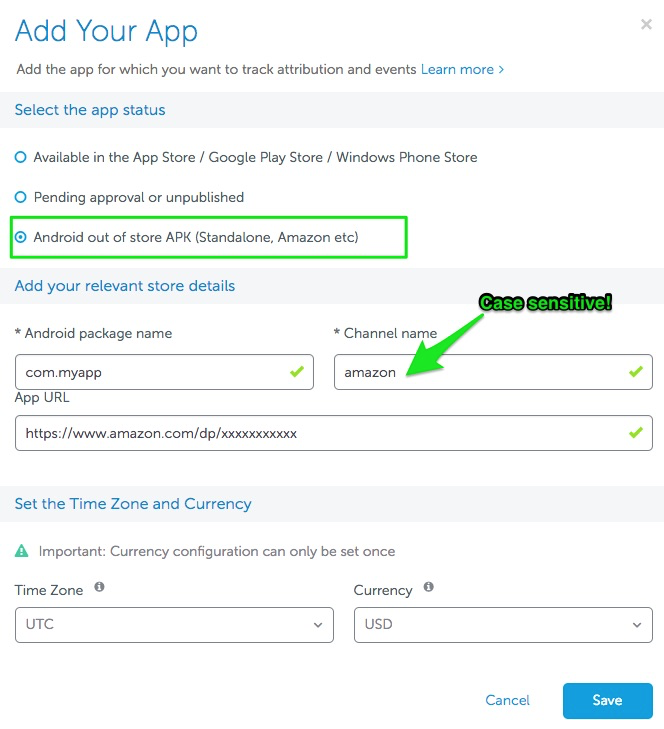 In order to drive users to the Amazon app store from Facebook, follow these instructions. Configure a URL link to the app in your Facebook App's Settings, under the Android section. Login to Facebook as the app’s admin, go to https://developers.facebook.com/apps/ and choose the app. Go to settings and find your Android settings, or if you have not already configured Android, add the platform. Fill out the required details, including the amazon app store URL specific to your app. In the AppsFlyer dashboard, under Integrated Partners, select Facebook, and enter the same Facebook App ID you use when tracking Facebook In-Store Mobile App Install Ads with AppsFlyer. 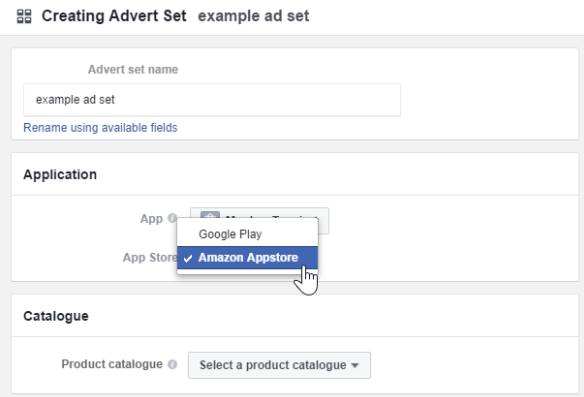 When setting up Advert Sets on Facebook, choose “Amazon Appstore”. Please note that this screenshot is taken from the Facebook Power Editor, and may be presented differently in FMP platforms. 1. Use an Android device that does not have your app installed or that is whitelisted. 2. Generate a test tracking link using Custom Media Source Configuration (instructions here). Use "test" as the Media source name ("&pid=test"). 4. Send the tracking link to yourself via email and click on it. Once redirected, do not install from the store. Instead, install the updated beta version app with AppsFlyer's tracking SDK embedded and launch it. Check your app's installation raw data report under the Export Data page. You should see one installation conversion with the “test” media-source. Under the column titled Install App Store you should see the name of the store as it appears on the manifest.xml file. You can also see the param "af_installstore":"STORE_NAME" in the logs of the install. Go to the dashboard of the app that is specific to tested store. Check your app's installs raw data report under the Export Data page or look at the overview page of the app. You should see one installation conversion with the “test” media-source. 2. Install the updated beta version app with AppsFlyer's tracking SDK embedded and launch it. Check your app's overview page for a new organic install (under the “organic” media-source). Currently, with the single app method, there is no indication to the origin of organic installs. Go to the dashboard and overview page of the app that is specific to the tested store. You should see one installation conversion under “organic” media-source. You can use AppsFlyer's custom dashboard to concentrate the marketing results from several or all of your apps, including apps for out-of-store markets.